Home Health 20 Killed By ISIS? ISIS took the responsibility for the bombings in Philippine through its Amaq News Agency. It also issued a formal communique for the twin suicide bombings, shortly after the Amaq report. However, there is no evidence provided by ISIS for its claim. 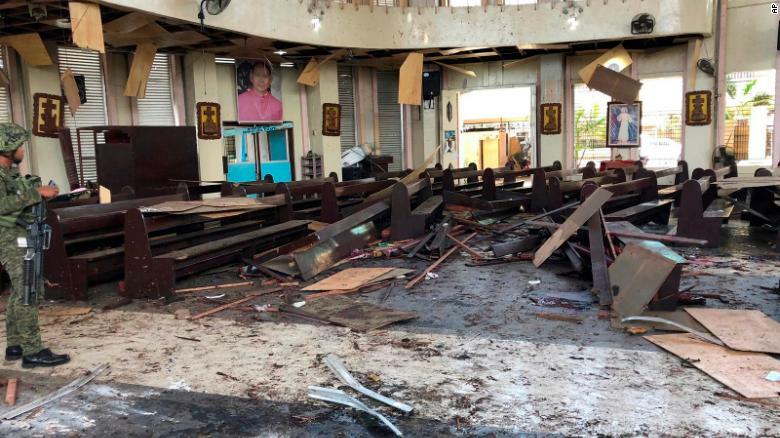 20 have been killed, dozens have been injured in Philippines church bombings. Two bombs were detonated at Jolo Catholic cathedral in the Mindanao region. At least 81 people, including 14 soldiers of Philippines Army and 2 national Police officers, have been injured. The first bomb blasted inside the cathedral, while the second went off near the soldiers who were helping the victims of the first explosion, Brig. Gen. Edgard Arevalo, Armed Forces of the Philippines spokesman, stated. According to the local officials, all casualties were immediately evacuated, the area is secured by the police and nation’s military. Next articleBig Blast Hits Venezuela’s La Guaira Port. Firefighters are Trying to Localize the Fire. Shocking News. Details Of The Death Of The Bus Driver Were Not Disclosed By The Investigation. A school bus driver died in an accident yesterday, he crashed into a parked car in the north of the suburban Libertyville.A man pulled down three parked cars around 5:40 pm. at 310 W. Rockland Road, from the Libertyville police report.According to law enforcement officers, they arrived first and revealed that the man does not show signs of life. They rendered first aid to the victim, after which he was taken to Condell Medical Center, where he died, police said.At the time of the incident, there was no one in the bus, and no one else was hurt, law representatives say.The cause is set by the Lake County Major Accident Assistance Group.Coroner Lake County does not comment on the details of his death.